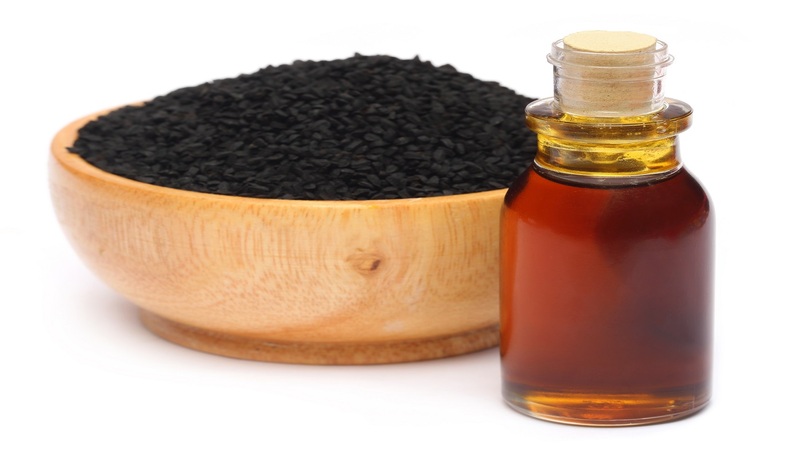 Benefits of Black Seed Oil? What are the benefits of black cumin seed (black seed) oil? ¼¼Black seed oil is promoted as a healthy, alternative oil for use on salads and other foods but it tends to be more expensive than other oils, such as extra virgin olive oil and avocado oil, and has a strong taste that some people find unpleasant. Limited evidence from clinical studies conducted primarily in Asia suggests that black seed oil, in liquid or capsule form, as well as black seed powder, may be helpful for modestly lowering blood sugar, blood pressure, cholesterol, and weight, and for improving asthma symptoms, but more research is needed to confirm these findings. In addition, for certain conditions, the efficacy may depend on which form is used (oil or powder). It is important not to confuse black cumin (Nigella sativa) seed with the spice cumin, as they are unrelated. See the full answer for more information about black seed oil and black seed powder, including the clinical evidence, dosage, and safety. According to the spice seller I purchased them from, Nigella Sativa seeds are also known as Charnushka, and are used in various cuisines around the world. For example, they are often added to Slavic sausages, used atop Jewish rye bread, and they are part of the Indian spice blend garam masala. They can be used to make a tea also. This CL Answer initially posted on 1/27/2019.